Edited by: Michael E. Williams Sr.
Baptists lack a single central figure in their origins that Lutherans, Reformed, Presbyterians, and Methodists have with Martin Luther, John Calvin, John Knox, and John Wesley. Additionally, Baptists focus so heavily on the Bible for authority and key beliefs or practices like religious liberty, social justice, missions, and preaching that sometimes Baptists and other Christians forget the significant role that people play in forging and promoting those ideas and practices. 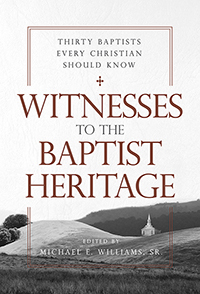 This book seeks to address this shortcoming by providing an introductory text of Baptist biographies. Certainly shorter than a full-length biography but definitely longer than an encyclopedia article, this sampling of key Baptist leaders through the years view the story of Baptists through a biographical lens while linking these women and men to a key Baptist distinctive. A short suggested reading list is added at the end of each chapter to enhance further study. Highlighted Baptist leaders include: Thomas Helwys, John Clarke, Benjamin Keach, Anne Dutton, Shubal Stearns, Isaac Backus, Dan Taylor, Andrew Fuller, John Leland, William Carey, Lott Carey, Adoniram Judson, J. Gerhard Oncken, I. T. Tichenor, Robert Cooke Buckner, Charles H. Spurgeon, Lottie Moon, E. C. Morris, E. Y. Mullins, Walter Rauschenbusch, Helen Barrett Montgomery, George W. Truett, William Owen Carver, James Henry Rushbrooke, Nannie Helen Burroughs, B. B. McKinney, Thomas Buford Maston, Herschel H. Hobbs, Henlee Barnette, and Gardner C. Taylor.